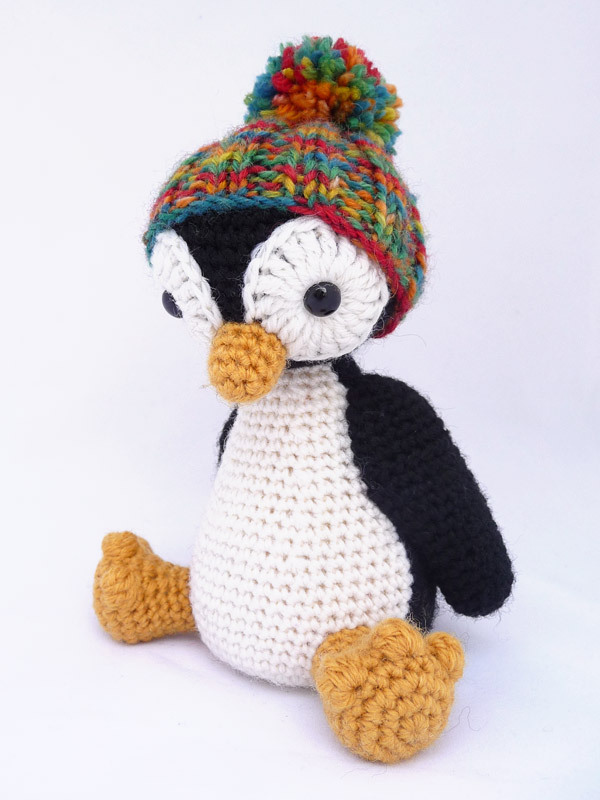 Amigurumi penguin will be a happy friend for yourself or a perfect gift for someone you love! This small cutie is now available as a free pattern in two languages, English and Finnish. The pattern requires intermediate crafting skills (I assume you know how to crochet and knit, the basic techniques are not explained there). It contains a plenty of pictures to help you with the details. Feel free to use these patterns under Creative Commons Attribution-NonCommercial-ShareAlike 3.0 Unported License. You would make me very happy if you could send me a note (leave a reply on this post) if you find these patterns useful. I would also like to see a picture of your finished project. Hi, what a nice penguin!!! Is it ok if I translate your pattern for our crochet club to dutch? I’ll mention your site and your name as the source and wont chance a thing to the pattern!!!! Of course you translate the pattern to your language! If you publish the translation online, please send me a link so I can add it to this article. Have fun crocheting in your club! Thnx!!!! When it’s online i’ll send you the link!! Mistä noita granulaattirakeita voi ostaa? I love this little penguin. His eyes are what drew me to him. This will be my first amigurmi although I have crocheted for years. My grandson loves penguins. If I can figure out how to send a picture when I finish I will. I really like your art. Hi, I have finished the 7 rounds (circle), and did 8 more rounds of sc, trying to figure out now if I am to work the rest in rows, turning at each ean of row??? Your pattern says rds(rounds), but if I keep going in rounds I am just going to end up with a ball. Please let me know. Hi Kelly, and thank you for your question! Just keep going straight forward in rounds, a ball is just what you need! That way you can create three-dimensional shapes without having to crochet several pieces and sew them together. Look for example at the head of the penguin in the picture, it’s almost a round ball with an open end (which you will attach to the body). Please let me know if this answer was helpful, or if you need more instructions. 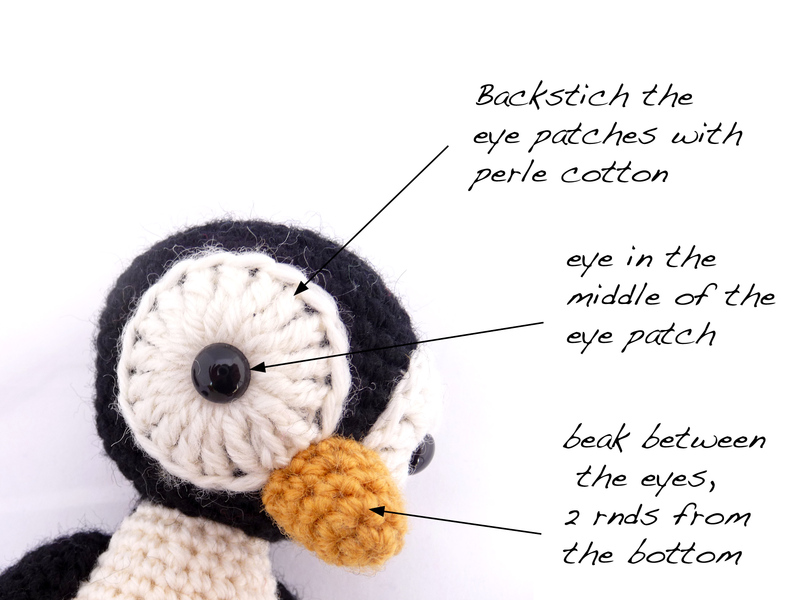 i would really like to crochet this penguin, however I am having trouble with the instructions. working in the MC i am not getting the right amount of sc?? Hi Amanda, and thank you for visiting my site! Could you give me a bit more information about your problem – which part are you trying to make and what do you mean by “MC”? Make a magic loop, sc 6. Pull loop closed. Is this pattern to be find in norwegian? Thanks for the pattern, this penguin is so cute. Took me ages to finish him because i got stuck at the part where you attach his front to his back, I left it for months and finally came back to it yesterday:) I just sewed him up any old way and you can tell when you look closely haha but at least he is finished now. Anyway thank you for the pattern, really appreciated!! I really love this penguin!! Rani, of course you can translate the pattern, if you publish the Spanish version with the same CC license I use in my patterns. Thank you for doing that, it’s great to inspire people in different countries! Hello, thank you very much for de pattern. I really liked this penguin so I did and tomorrow I’ll post on my blog, I will put a link to your website, I hope you like it. Sorry but I’m Spanish and I can not speak much English. Thank you very much! Hi I really love your design but was wondering how tall it is. You see I'm making it as a stuffed animal for a friend and I want it to be big enough for a teen to hug. Thank you so much for creating this pattern and I hope you get this. whoops! What I meant to say was if I wanted to make it larger would I double all the measurements cause I want it to sit at about 30cm. I can’t seem to download this pdf. Can it be emailed to me? The download link was broken, my apologies. I have fixed it and you should be able to download it now. I made two animals from this pattern. Thank you, thank you for the delightful penguin. So kind of you to share it with us. Hi Anu. Im not being able to download the pattern. Can you please help or email it to me? Love the jazz crow and penguin pattern – must make these soon. Thank you so much for sharing. Love the Jazz crow and penguin pattern – I must make these soon. Thank you so much for sharing. It is so cute! 🙂 May I translate it to Danish and post it on http://hækleopskrifter.dk with credit to you? Hi, of course you can translate this pattern to Danish. Please share your version using the same Creative Commons BY-NC-SA I have used. Hi. I am in the process of putting the penguin together and have run into a little snag. I think I have messed up and am a little confused on sewing the black and white pieces of the body together. Can you assist? I am not too sure how to put them together to stuff. This is a gift and I want to make sure it is nice! I really love the penguin! It’s so cute and I wanna make it for a friend of mine. Is there any possibility to make the penguin in an easy or general way bigger? Thanks for this cute pattern 🙂 I`m getting ready to make my second one. My 1st was a cute little purple penguin. I wish I could post a picture for you. I loved the penguin so much it is a work of art. I was wondering when you do the body if you need to make 2 different parts or just one with 2 colours. When you do the body of the penguin, you need to make 2 parts with 2 different colors, then fold them flat and then sew them together as shown in the picture that is included in the pattern. Then you will have one body piece which is half black and half white. aloin tekemään pingviinin vartaloa. Ohjeessa sanotaan että pitää tehdä kaksi palaa joista tulee ns. iso pallo, eli esim. musta ja valkoinen. Kun yhdistän nämä palat, tuleeko ne vaan sillain että ne taittaa kaksinkerroin, jolloin pingviinin sisään jää ns. puolet näistä? Juu, tehdään kaksi samanlaista vartalokappaletta, musta ja valkoinen, taitetaan ne kaksinkerroin ja ommellaan yhteen. Eli puolet kummastakin palasta jää pingviinin sisään ja vartalokappale on ikään kuin kaksinkertainen. Hi Anu, I really like your patterns. Your work is amazing. I“m starting a new blog about crocheting. Would you agree if I post there a translated pattern of “Penguin” to Bulgarian. Can it be sent to me by some other method please. My granddaughter is desperate for two of these. Hi there! I love this penguin! Thank you so much for sharing the pattern. I hope you don’t mind, I did a pattern review on my blog. I am making another penguin toy! ESTHER ROADNIGHT OAM, are you trying to print the pdf file to paper? I guess sending it to you by some other method would not help with the printing, because you should be able to print the file that can be downloaded via the link in this article should like any pdf file. The penguin is approximately 16cm tall (plus the pompom on the beanie). I love this! Thank you! My photo is on my Instagram. People love your penguin! Please do you have this pattern in UK crochet terms, not American. Further to my last comment, I am a 77 year old in a Rest Home, with associated health problems and my getting old brain just can’t cope with translation. Hope you can help. Mie from Denmark, I’m sorry it took this long for me to answer, your comment was stuck in the spam filter for some reason and I just found it from there. All the pictures I have have been included in the pattern. As the pieces are crocheted in a spiral and each row is not ended, they will look a little crooked before they are filled. Jill Holland, Originally this pattern was written in Finnish and I translated it to English the best way I could. I too have problems with the different terms between UK and American patterns. :/ So I’m afraid I can’t help with the translation. I dear i think to ne stupoid because i cannot get how to male the feet 🙁 could you please tell me how to do the toe? I am confused by the instructions to make two body parts. Do I make a round white circle and black circle? Barb, you make two similar bodies, one black and one white and then fold them and stitch them together so that you get a piece that looks like one body but is half black and half white. There’s a picture in the pattern to help you with that. I had a few problems with this pattern. Don’t rely on the number of stitches at the end of the row. Some of them don’t add up. You need to make your best judgement on your stitches to look just as good as the pictures. On the body, you need to not connect each round to make a spiral. It does not come out correct. I know I did it 3 times and took it all out. Finally I just turned and continued with no chain one and followed the row. This was difficult to follow either too many stitches or not enough. I made this for my local restaurant Penguin Eds. Yummy bbq and lots of penguin but did not have a crocheted in the bunch. love, love your pattern for this gorgeous penguin. I hope you don’t mind, I write a blog about things I have made and always credit the creator. I have written my draft to publish later on this week giving your blog full credit. I hope you are happy for me to do this. rounds are not joined. When coming to the end of the round, just continue into the first stitch of the previous round.” The number of rows or stitches is not that important, just make sure that the decreases or increases form a straight vertical line. Hi. What do you mean by backstitching the eyes? And what does whipstitch mean? Do you have any detailed instructions with some more photos? I love your penguin and I thank you for sharing it. 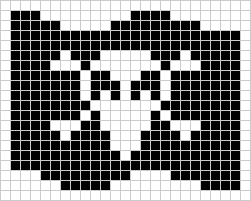 I am having a problem understanding about making two pieces, one white and one black. Do you change to the black yarn when making the body? I’m sorry I have read it over and over and it just isn’t clear to me. Thank you for your time. Thank you for your comment, Diane! Making the body has been tricky to other makers too. You don’t need to change yarn while making the body you just make two complete body pieces that are otherwise identical but one is made with white yarn and the other with black. Then you fold them flat and sew them together as shown in the picture in the pattern and the result is a piece that looks like the body pieces you first made but is half black and half white. And then you can fill it. Did this make it any clearer? Hi Anu I followed your pattern but my penguin looks nothing like this one the body is really wide. I’m really confused about the body. Do you make 2 circles for the body? And when you say fold them do you mean in half and how do you see them together once they are in half? Really struggling! Hi Shannon, please read the discussion above, specially my answer to Diane last week. You make two separate full body pieces, one in black and one in white and then sew them together. There’s a picture on page 8 of the pattern that shows how you should sew them.